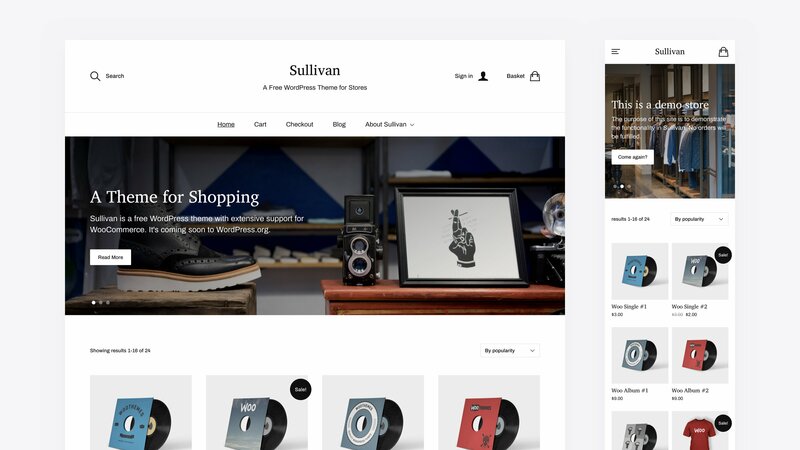 Sullivan is my latest WordPress theme, and the first of them to be built specifically with WooCommerce in mind. Sullivan includes custom styling for all WooCommerce pages and features, and it also adds a couple of custom ones on top of them. It has search with instant results served over AJAX, dropdown modals for the basket and account settings/login in the header, slideshows on the shop page and blog page, optional sticky menu, a fallback image setting, and much more. I actually finished Sullivan a couple of months ago, just after Christmas. When the theme was finally packaged up and submitted to WordPress.org for review, I was too tired of looking at it to be bothered to setup a demo installation, so I let it sit in the drawer for a while. It’s been slowly making its way through the theme review queue since then. It was assigned a reviewer this week, which usually means a release is pretty close, so I figured it was time to get started with the theme page and demo installation. You can read more about Sullivan here, and you can check out the demo installation here. I’m looking forward to seeing this one out in the wild. Update: Sullivan has now been released. You can download it through WordPress.org.